The Joy Of Givi. . .
Nipun’s high-school goal was to become either a tennis pro or a Himalayan yogi. However, by the third year of his Computer Science and Philosophy degree at UC Berkeley, he started his software career at Sun Microsystems. Dissatisfied by the dotcom greed of the late ’90s, Nipun went to a homeless shelter with three friends to “give with absolutely no agendas”. They ended up creating a website, and an organisation named CharityFocus. Today, CharityFocus’s 18,500 members incubate compassionate action in a multitude of ways and its inspiration portal gets 100 million hits a year. 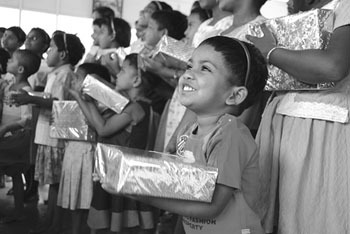 In 2001, at the age of 25, Nipun quit his job to become a full-time volunteer. He didn’t have a plan of survival beyond six months, but so far, so good. In January 2005, Nipun and Guri, his wife of six months, dropped everything to embark on an open-ended, unscripted walking pilgrimage in India to “use our hands to do random acts of kindness, use our heads to profile inspiring people, and use our hearts to cultivate truth”. Living on one dollar a day, eating wherever food was offered, sleeping wherever a flat surface was found, the couple walked 1000 km before ending up at a monastery where they meditated for three months. Today, both Nipun and Guri live in Berkeley, do small acts of service with great love, and run CharityFocus. Unsurprisingly, the work of CharityFocus regularly touches thousands of lives in a myriad of different ways.